Folks we are hosted at a University and we have been on break for the past two weeks. Thus, we haven’t really been doing Open3DP things. However, we are back in session now. AdderFab is the combined result of three separate Capstone student design teams over a span of over four years. 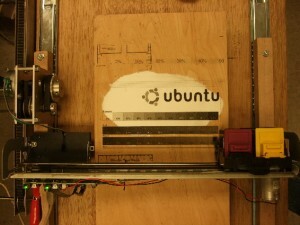 The original name of the project was P3P (personal 3D printer). The original team (Version #1) was composed of Kory Koyamatsu, Kristina Olson, Erik Roby Nathaniel, and Thompson Tri Truong. 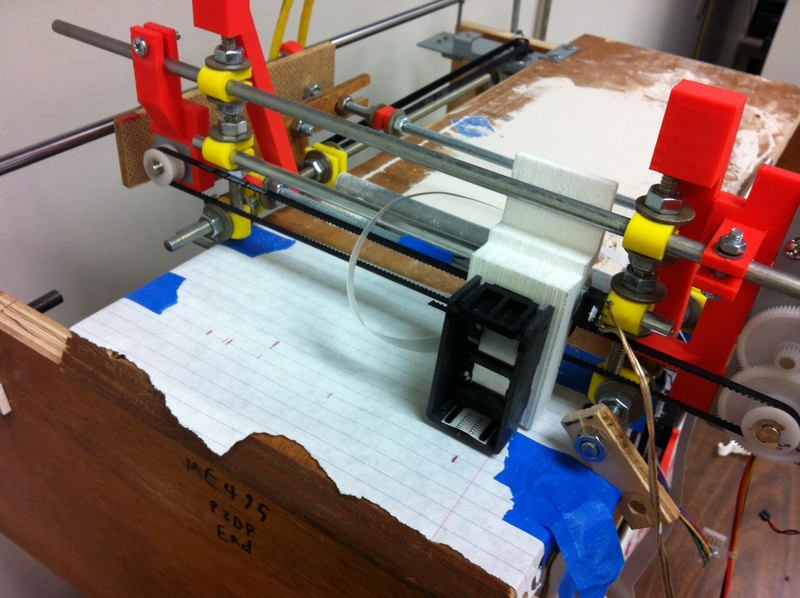 Their project produced a prototype 3D printer which almost worked. 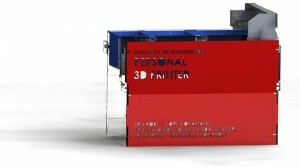 They filed a group report Design and Fabrication of a Powder-Based Personal 3D Printer. The objective of this project is to design and prototype an open source, open architecture, powder-based three dimensional printer. During the course of the project a prototype system was manufactured and, during subsequent testing, was found to successfully print objects by applying an organic binder to a multi-mode sugar powder. The prototype system consists of three main subsystems: the enclosure, the powder chambers, and the print carriage. The enclosure is made from a set of interlocking acrylic panels that are joined by threaded fasteners. There are three powder chambers, feed, build, and waste, which store powder in its bound and unbound states. Powder for each layer is transferred from the feed to the build chamber using a manual spreader bar after the feed and build piston are moved vertically by a non-captive linear actuator. The print carriage is supported by a pair of rails and is moved over the powder beds by a rack and pinion gear system. Carriage and print head motion is controlled by stock Lexmark Z735 hardware and software, with only minor hardware modifications. The main strength of this design is the low total cost compared to all other powder printers and even other open source rapid prototyping systems, with an estimated cost for the end user of $1,600. 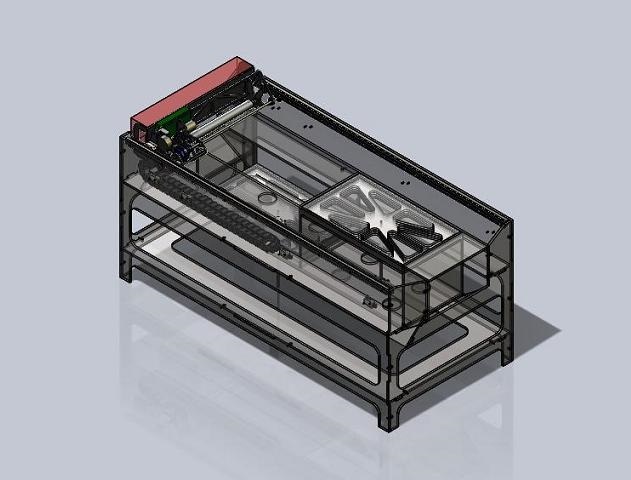 Due to a small number of parts, the availability of drawings, and a limited number of modifications to the print assembly, maintenance is not only possible, it is simple for an end user to perform. For a first generation prototype, the repeatability, as observed during preliminary testing, seems very promising. Despite the strengths, many aspects of the first generation design could be improved. Adding a return mechanism would be the first step in fully automating the build process. An improved and automated spreader bar would also allow thinner layers. Finally, a more secure method of mounting to the rails would improve the repeatability. The P3P represents a significant achievement to be realized in ten weeks. The P3P promises an open source system that allows hobbyists, educators, and anyone with an interest in free-form fabrication to experiment with a smaller investment of time and money than any other platform currently allows. The objective of this project is to design and construct an open source, open architecture, affordable, powder base 3-D printer. During the project a working prototype was constructed, tested and determined to successfully print objects using ink and a sugar based powder. The prototype printer consists of six different components: the enclosure, the powder beds, the gearbox, the print carriage, the powder spreader, and the return mechanism. 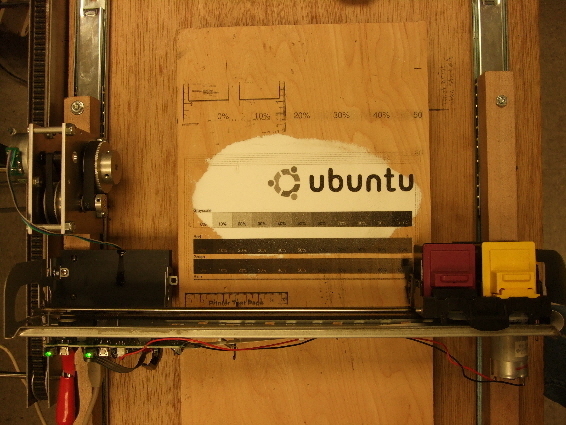 The prototype’s enclosure is constructed of wood using wood screws as fasteners and contains drawer sliders to support the movement of the printer in a smooth manner. There are two powder beds one for the build the other for the fill. The gearbox’s design was constructed to attach to drawer sliders to drive the print carriage over the powder beds. The print carriage is from a Lexmark Z35 printer, and is mounted to the sliders. The powder spreader is the roller part found used in the original printer as a paper feed. The return mechanism uses a belt to drive the printer back to its initial position. The P3P2 printer achieved most of its goals, but its main strength is that it is an affordable alternative to the 3-D printers available on the market today. It also corrected the printing stability issue that was encountered during the previous P3P project as well as reduced the number of computers required to one. P3P2 added a return mechanism to further automate the process as well as a powder spreader. The P3P2 achieved a lot of the objectives set forth from the initial P3P group, but it still left several areas for future improvement. These areas include aligning the printer properly so that the layers of the parts line up, and also include the self automation of printing a whole part using only one input from the user. The P3P2 gives a further look into the advancement of the P3P project and some ways to improve upon the initial P3P design, and construct an affordable alternative for the average person to the 3-D printing problem. Version #3 was created and posted by Kevin Hawkinson (KevinH) on thingiverse. Kevin was a member of the Version #2 team and he choose to stay with the concept of employing an existing printer’s carriage. Version #3 was based on a Lexmark z715 inkjet printer. Kevin went through and cleaned up most of the issues left in Version #2. He has a BOM, Cut files and Model files. Nicely done! The goal of this project is to develop a low cost, open source 3D printer utilizing standard inkjet technology,for personal use. to the carriage frame, a textured powder roller spreads powder from the feed area over the build area. In order to obtain a better surface finish, a DC motor rotates the powder spreader as it moves across the print area.The feed and build chambers are constructed from PVC fence posts. A scissor lift controls the vertical displacement of the piston in the build chamber, while a screw lift controls the piston in the feed chamber. The electronic controls use an Arduino Mega to run all of the printing systems. The design resulted in a working prototype that fulfills all of the design constraints. The rod frame carriage design is lightweight, easy to assemble and easy to integrate with the other systems. The powder spreading system produced a very nice layer thickness and surface finish even before the system could be optimized. The scissor lifts designed for the feed and build areas, reduced the overall height of the printer allowing it to fit in a standard fume hood. The Arduino used in the electronics has a large library of resources available to perform things like LCD, SD card, and stepper control. Areas where future work should be focused include replacing the y‐axis stepper motor to improve printing speed, making molds and casting printable parts to bring down the overall cost, developing host side software, optimizing the speed of the powder spreading cycle, and modifying the design of the scissor lifts to improve their stability. The design will have a significant impact in that it will allow 3‐D powder printing to make the jump from the commercial realm into the homes of people around the world. An affordable desktop 3‐D powder printer will let students, artists, hobbyists, and others print objects in their own homes. The next team has been assembled to take this prototype and productise it to produce an available open source 3D powder printer! The objective of this project is to design and construct an open source, open architecture, affordable, powder base 3-D printer. This project is advised by Dr. Mark Ganter. During the project a working prototype was constructed, tested and determined to successfully print objects using ink and a sugar based powder. Is there a reason that they are constrained to not using existing printer carriages? It appears that using an established carriage would make it more easily reproduced/reliable and more cost effective. Also are the reports available for perusal? for wide availability and long term support. POS systems are available for a very long time. We are releasing information as best as we can. We have a new team working on making it a product available open source. Well folks, I wish you all the best with this, and will be over the moon when you release the design files. I’ve tried hacking several printers with a view to setting up a powder-based 3dp system but the electronics is beyond my tinkering ability. Currently working on a 3-axis cnc router table instead, which is going very well, but I would be so excited to build an additive system as well. Good luck! Are you planning on making the reports you mention in this post available to the public? I’m particularly interested in V2 (Personal 3-D Powder Based Printer Version 2.0) and V3 (MONO-­‐MATERIAL PERSONAL 3D PRINTER) as I’m embarking on a powder printer myself and have just been given a Lexmark Z35!